We have a new baby boy in the house who's 4 months old now. He loves to be held upright so he can practice standing on his chubby little legs. 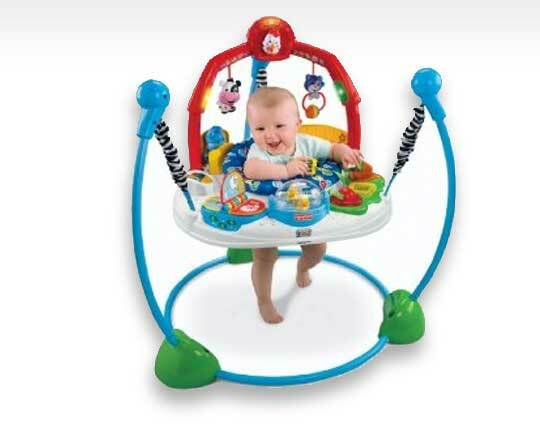 This Jumperoo gives him a chance to practice this some more, as well as bat his hands at different toy attachments. Sometimes he gets very excited about being in there and is happy for almost 30 minutes, other times he gets cranky much earlier. So overall, it makes for a nice addition to things to do with the infant during the day, providing him and parents some helpful and fun variety in activities. I love the two audible modes. One teaches words and the other plays music. The book opens and the word is said. Very cute. Of course, any jumperoo is fantastic, but I liked this one better than the precious planet because it offered more activities and seemed more educational. I didn't like the palm leaves hanging down on the precious planet. It would seem annoying to have that hanging over her head. Not too mention the banana and the bird would be out of reach and would frustrate my 4 month old. So, this barnyard jumperoo has lots for her to do and would recommend this one over the rainforest or precious planet ones. This farm-themed jumperoo is full of fun ways to reward baby's jumping as he/she laughs and learns with 2 ways to play. In the Musical Fun mode, there are six different toy stations plus two overhead toys that let baby activate lights and five fun melodies. In the Early Learning Fun mode, cause and effect, colors, shapes, object & animal identification and animal sounds are all introduced as baby's jumping activates lights and three sing-along songs. There's a shape-sorting garden, and a farm flip book that does something different every time baby flips the page. Plus a bobbling rooster that moves when baby does, a cow with rattle beads, pop-and-play piggies, a mirror pond, a peek-a-boo horsey and lots more. Mom can activate 10 minutes of musical play, including melodies like Farmer In The Dell, Hey Diddle, Diddle, Mary Had a Little Lamb. Sturdy, free-standing steel frame lets baby jump safely - no doorway required. Height adjusts as baby grows, and soft spring covers keep little fingers safe. Copyright N.B.G. LLC © 2010. All Rights Reserved.